The Wesleyan Covenant Association is honored to announce that the Rev. 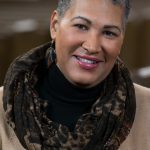 Dr. Joy J. Moore will speak at its Third Global Gathering at Mt. Bethel United Methodist Church in Marietta, Georgia on Saturday, November 3, 2018. Moore’s address “Unashamed to Preach Scriptural Holiness” is part of the Gathering’s “Unashamed!” theme. The event is expected to attract thousands of United Methodists across the connection. A much sought after preacher, Bible study leader and teacher at workshops, conferences, and worship services around the country, Moore is currently Lead Pastor and Ecclesial Story Teller at Bethel United Methodist Church in Flint, Michigan. Moore’s resume is rich and extensive. She served as Associate Professor of Practical Theology at Wesley Seminary at Indiana Wesleyan University. She taught at Fuller Theological Seminary in California where she established the William E. Pannell Center for African American Church Studies and served as its first Associate Dean. Fuller Seminary recruited her to provide vision for the center from the Divinity School at Duke University in Durham, North Carolina where she served as Associate Dean for Church Relations, Associate Dean for Black Church Studies, and Visiting Professor of Preaching. Previously the director of Student Life at Asbury Theological Seminary in Wilmore, Kentucky, and chaplain and director of Church Relations at Adrian College in Michigan, she has held pastorates in the Michigan Area of the United Methodist Church. Her chapter in Andrew C. Thompson’s Generation Rising: A Future with Hope for the United Methodist Church (Nashville: Abingdon Press, 2011), calls for preaching that takes seriously the story of Scripture over the moralisms we choose to impose on its stories. She has also contributed to the books Essential Truths and Unity, Liberty, and Charity and has written for Sojourners magazine, Christian Century, WorkingPreacher.org and Good News magazine. A native of Chicago, Illinois, Moore’s desire to teach led her to earn a BA in Education and Mathematics from National-Louis University in Evanston, Illinois; a Master of Divinity from Garrett-Evangelical Seminary, also in Evanston; and a PhD in practical theology from London School of Theology/Brunel University, London, England. Moore has focused on cross-racial ministry in urban, rural, and suburban congregations. As a pastor, she has called local congregations to recognize their vocation of glorifying God as a peaceable community—practicing hope, hospitality, and honesty. She has also served the United Methodist denomination at the General, Jurisdictional, and Annual Conference level. She became a John Wesley Fellow in 2001, and is a member of the World Methodist Evangelism Order or the Flame, the Academy of Homiletics, the Society for Biblical Literature, and the American Academy of Religion, where she served as co-chair of the Evangelical Studies Group (2012-2016). She is currently the president of the Christian Theological Research Fellowship and 2nd vice-president of the Wesleyan Theological Society. Moore recently joined the Christians for Biblical Equality International Board of Reference having just completed serving on the board of directors for ZOE Ministries. She is an avid fan of books by David Baldacci and John Hart and, when she is not teaching, she enjoys traveling, watching reruns of NCIS, and reading. Currently, she is reading the works of Octavia E. Butler, and rereading the works of John Wesley. Eventually, she intends to blog at www.joyjmoore.com. The WCA is excited to have Rev. Dr. Moore as one of it speaker at its Third Global Gathering. To join thousands of others, click HERE to register at the host site or a simulcast site near you.